The final result: my impatient Danish. Worth every single minute of effort. It’s Labor Day today, so I’m not going to labor too hard over this post. I actually started my draft on Friday, but over the long weekend, it’s been hard to do anything other than sit outside, nap, read my book or indulge in a nice glass of wine and dinner out with Terry. 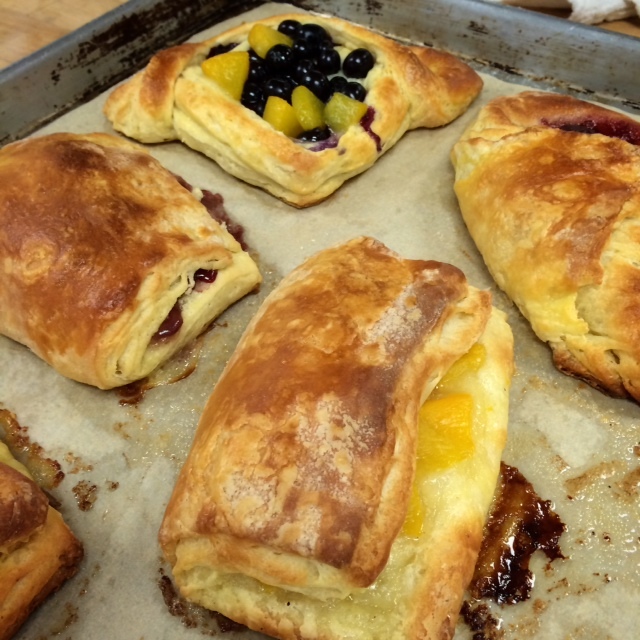 In our second series of bread making, the focus was on laminated and sweet dough. Or as I like to call it, “I’m glad I learned this in class because I’ll never make it again.” As I’ve mentioned before, some nights, I am just low on patience and these breads all take a lot of time. I’m also not so adept with rolling out and shaping dough, so that’s been we’ll say, “fun” to have to deal with. However, for whatever frustrations I have while in the kitchen, it’s always 100% worth it when I get the first bite. Sometimes I can’t believe I actually made these things. I will forever have respect for professional bakers. Thank goodness there are people that choose to do this all the time. 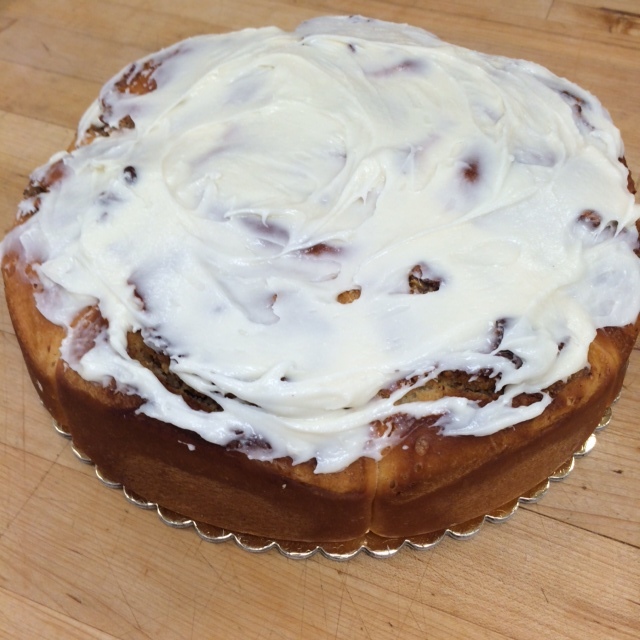 Wednesday night started off with our sweet roll dough. 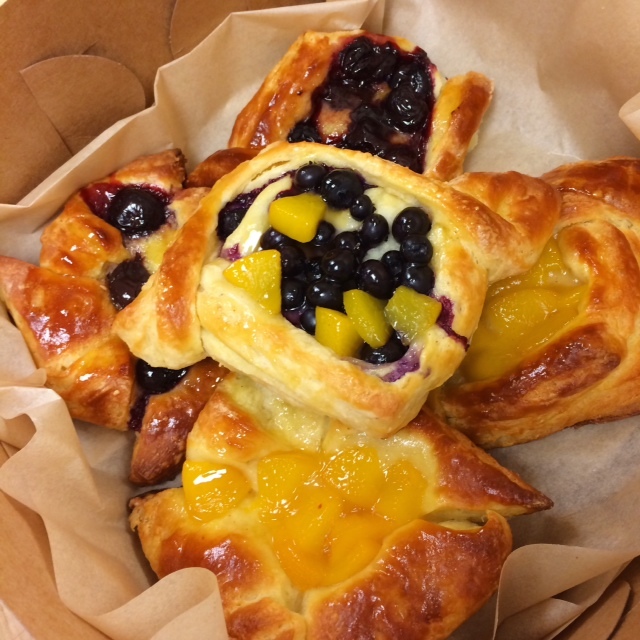 Once we got that together, we went to work on the Danish pastry dough. This one is pretty high maintenance. It’s not so much mixing the dough that’s a big deal, it’s the rolling and folding that takes forever. With Danish pastry, you first roll it out into a rectangle and once the butter has warmed up enough (or, as it’s called in the industry having “plasticity”), you then slather two-thirds of the dough with it. You’ll go through an ungodly amount of butter, but it’s a necessary evil because that’s pretty much the only reason Danish taste so delicious. Once the butter is “locked in” (which is the term for the first fold to encase the butter), you move on to your first “fold”. After the first fold, the process of turning begins. For each “turn”, you fold and roll the dough again. Then it’s back into the cooler to rest for a minimum of 30 minutes between turns. You do this 2-3 more times, and there goes your entire day. Because our class is only 4 hours long, we only did one turn on Wednesday and completed the rest of the turns on Thursday. I admit to just wanting to get it over with and did not roll out my dough as thin as I should have, and that’s why I call my final result an impatient Danish. Had I done it all perfectly, I probably would have had better end results, but the taste was still pretty darn good. As for the sweet rolls, they were filled with a maple-pecan spread and topped with a yummy cream cheese icing. Nothing exactly a photogenic dish, but tasted pretty darn alright to me. Whatever you’re doing with your long weekend, hope you enjoyed it and ate something yummy! Two more weeks of baking and pastry, then a short break and in early October, I start with stocks, sauces and soups!